Hi and welcome to yet another stimulating debate! Today's random topic is that all forms of education should be free. The resolution is self-explanatory and all words carry their standard dictionary definitions. 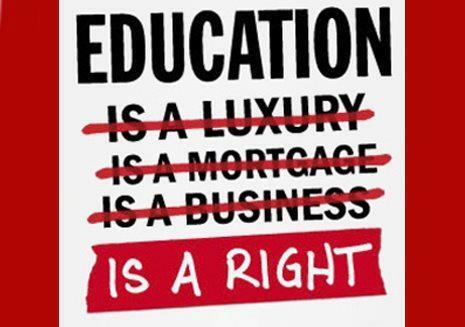 Education is a Human right, not to be limited by personal wealth. An Educated society prospers and progresses. 1. Education is a Human right and should not be limited by wealth. It is very clear from these two quotes that the intention of this document is that Education should be accessible to everyone and should not be limited to only those with the means to afford it. It even goes as far as to mandate that certain basic levels of education MUST be free, but certainly the context suggests that this should be seen as a minimum requirement and not an optimal result. In every country of the world today there are people having to forgo education because they can't afford it financially. This side of the house agrees with the draftees of the UDHR - this may be a necessity but it should in no way be considered optimal. Education SHOULD be free. 2. An Educated society prospers and progresses. It's self-evident that technological, social, medical, scientific... EVERY area of civilization advances through education. Not that I really expect anyone to contest this, but as support, here's an OECD study that links an educated society with numerous benefits, including happiness, civic engagement, scientific and technological advances, health benefits and even a longer life! P1: Society benefits from a more educated populace. P2: Financial costs prohibit and restrict an educated populace. P3: Remove those financial costs and more people will get educated. C1: Remove the financial cost of education and society benefits. We know that currently there are many people who WOULD be educated if they could afford it. This article is one of a depressingly high number that details how 62% of Americans can't afford Public College. Given this, reducing the cost of education until it is free - the optimal result; should be our collective goal. The big problem is that the government is spending too much money on schools without any payback, putting a huge stress upon the government's finance, and possibly encouraging a need to greatly increase the tax. As source  shows, "$12,000 in the Phoenix area schools...." And "...$27,000 in the New York metro area..." Are being spent on these schools. In addition, as source  finds out through the NCES, "state and local governments are spending wellover $500 billion on public K–12 education." This shows that the government simply cannot afford to keep all forms of education free. They should at least put some money on some schools, maybe only select the best of the best, but we cannot keep on spending billions and billions of dollars on education and expect to be able to still pay for the other types of spending's (military, roads, etc.). In fact, these vast spending's on education force the states to cut their budget, with source  stating examples from Phoenix, which had a budge cut of nearly $100 million, and California forced to cut off "a shocking $46.6 billion...". You see, with free education, the states' budgets simply cannot work well enough to take care of their other spending's. Not to mention I haven't even gotten to university/doctorate education. In fact, the statistics are astonishing, just about as terrible as those statistics mentioned above. "Between 1975 and 2005,total spending by American higher educational institutions, stated in constant dollars, tripled, to more than $325 billion per year." Source  says. This shows how hard it is to take care of an university/college. Adding up the numbers, we now get a massive $825 BILLION dollars spend on education. The government is already largely in debt, and has a hard time paying off their massive debt. ( right now as I post my argument; from source .) Do you want to give the government more debt? I think not. Heh, it's kind of a lame joke. But it doesn't matter. I've fulfilled my BoP, and shown that not all forms of education should be free. 9spaceking: Do you agree with my statistics of the massive spending on education and the massive debt of the government? nzlockie: I agree that the USA is one country that has massive debt. Since Education comprises a percentage of their spending then it follows that it comprises a percentage of their debt. The USA is no poster child for economics OR education! nzlockie: Do you agree that if we had a choice, education SHOULD be free? 9spaceking: most education should be free, but not all. That is the crucial pinpoint within the resolution. nzlockie: Excellent - that agreement will save us some valuable time and character space. So far the only specific form of education you've said should be withheld is Prison education. Are there any other forms of education you don't believe should be free? nzlockie: If you can give me a list or a criteria I can use to divine which forms of education your side believes should always cost money, that'll help streamline the remainder of this debate. 9spaceking: Also, when old (or middle-age) people choose to go back for more education.....yup. nzlockie: That's it? So we're agreed that your list of education forms which require financial remuneration is limited to; Tertiary, Post-Grad, Adult and Prison- correct? All other forms should be free? nzlockie: You really should have introduced this list in your first round so that I had a chance to rebut. All good though, I see no big challenge here. Once you confirm the list we can move on with the cross examination. 9spaceking: Incorrect. I am also suggesting a choice of perhaps a few handful, either the best, or randomly chosen schools, to force people to pay fees because just those schools won't be enough to compensate for those billions of dollars spent on education. 9spaceking: Those schools can be kindergarden, primary, or secondary. nzlockie: If it were possible for ALL forms of education to be fully funded, so that the student could study for free, you have said that some forms should still require payment. What are these specific forms? nzlockie: Since we both agree that MOST forms of education SHOULD be free, aiming we have the ability to make that happen, this debate needs to centre on those forms we disagree on. 9spaceking: I agree. I already told you all the forms. nzlockie: Great! Based on your defence of the need for fees for the "handful of schools", (kindergarten, primary and secondary), is it fair to say that if it were possible to run those schools WITHOUT incurring debt, then your side would support no fees on those ones as well? nzlockie: *fee. Charging a fee. stupid autocorrect! 9spaceking: So yes, some schools may want to charge trouble-doers, or put them in debt if they turn out to have horrid jobs or start commiting crimes. Then these grown-up adults can start paying for their education. nzlockie: please don't introduce a completely unrelated source in CX. If anything it supports my side more than yours anyway. nzlockie: I'm sorry I've reread your comment, ("so yes, some schools may want to charge... ") several times and I can't make sense of it or see how it answers my last question. could you please rephrase? 9spaceking: eh okay. I'll try to not do that. nzlockie: OK, I understand now. New question: In your round you claim we should always charge criminals for education because they don't deserve it. Why should we charge adult students - same reason? 9spaceking: no, only because they want to go back for more and THEY are making the choices, instead of their parents forcing them to go to school. nzlockie: cool. same argument for tertiary and post grad right? because it's their choice, not their parents? 9spaceking: And, the professors earn far more, with the equipment far advanced, possibly with labs and advanced technology to suit the needs. I thank my opponent for that revealing round of Cross Examination, and I'll begin my final argument round by addressing some of the points raised. My opponent opened the CX by asking if I agreed with his numbers. While I admit I haven't exhaustively verified them, I freely concede that the USA is one of the worst countries in the world at managing education. Their value for dollar ratio is abysmal and they know it. This Forbes article is literally the first one that comes up when I google the USA education system. It asks WHY the American system is so broken and what they can do to fix it. Ironically, the three people it asks are all American and are all products of a failing American education system but there you go... the point is that in ANY debate about education, the USA should not be used as a model for anything but failure. Harsh but true. The following point is important so I'm going to bold it: This debate is not about whether a free education is economically achievable. It is a philosophical motion and asks whether a free education is a goal we should strive for. At this point my opponent concedes that a free education IS a goal we should strive for. As a society we are judged on how we treat our criminals. Education has been shown to be a pathway out of crime. If we are truly committed to having a justice system that seeks to remodel criminals, we MUST give them the tools to succeed. Education MUST be free for criminals. In fact it should be compulsory. On the other hand, if we seek only to punish criminals, rather than reform them, then we can simply remove education from them totally. Their breech of one Human right has cost them their own. While not exactly merciful, this would be seen as fair by most western societies. PRE-SCHOOL - SECONDARY SCHOOL: My opponent's only justification for this is economic. As I said, this is not valid since we are not discussing the viability of a free education. There ARE economic systems that would result in free education, but before we can debate the viability of those, we need to decide if that is a direction we even want to go. That's what THIS debate is for. ADULT - POST GRAD EDUCATION: My opponent's main concern here is that these people have already had a chance and should be forced to pay for any extra. On the contrary, if anything we should be paying THEM! Society relies on the breakthroughs that come from our higher educated brethren. This point was made in my first round, most poignantly by my syllogism which CON CONveniently ignored. He makes the point that higher education costs society more but ignores the fact that higher education also contributes more to society. Judges, it's important to note that in my first round I brought two solid arguments as to WHY we should strive for free education. My opponent has not directly addressed either of these and so they stand uncontested. His only argument has been that, in his opinion, paying for a free education system is not a viable option. His only evidence for this argument, (which doesn't even directly address the resolution) is to show how much money the American education system costs. A system which he admits is a failing system. So what's the real problem here? Spending too much money? Or is it not enough value for dollar? Because those are two very separate issues. Neither of which directly addresses today's motion. The resolution has been affirmed boi, Xzibit says vote PRO. My opponent claims. But, it is. If we cannot achieve education economically, then education cannot, and should not be free, as we then cannot afford education. We cannot remove education for criminals; and there must be extra punishment for those evil-doers. It will encourage them to commit less crimes, in addition to their usual fine and prison time they also have to pay for education, they will soon think of it unfair and try not to commit any more crimes. This point doesn't make any sense. They made the choice of going back to education, instead of being required by law. They should pay for education because they made the choice to go back to school for much more complex institutions with more advanced techno-labs. With the high doctorate degrees education, these equipment can be very, very expensive, as well as the hiring of professors. We simply cannot afford to have every single form of education be free. Even if we force everyone who goes to school only donate one dollar, it would still help us and balance out the economy. There's a reason we have to pay for lunch money, or buy lunch from outside. Eating is a right similar to education, yet it is not free. If we cannot eat for free--and keep in mind the food costs much less than the equipment, teachers, building cost, etc.--then there is no reason that education should also be free. We should at least pay some money into education, if not all. rich people don't need their money. In fact, research shows that rich people have a large amount of money not being spent. Clearly, we should put some of the money donated to charity to the schools. Education may be free to the poor, and even the middle, but the top one percent definitely does not need that extra money. They donate to charity, some of that money goes to education, and viola, problems solved! Remember, these rich people want to help the government, and they don't need the extra money, therefore it is only moral that we use the money wisely. Not only will we be able to help out the poor children around the world who can't even afford the lunch money of the cafeteria, we will also be able to support the large amount of money we spend on education and balance out the huge amounts of money we spend on education. Also, if you think about it very carefully, if we increase the taxes to balance out the money spent by the government, technically we're asking the people to give a little more money to the government for education--so that technically means we DO in fact already pay for education, little more at a time based on how much the government spends on education. Have you thought of that, my opponent? 9spaceking: Do you agree that the top 1% rich have too much money to spend? nzlockie: No. There's ALWAYS a way to rid yourself of money. In fact, I'd advocate that the top 1% are probably where they are BECAUSE they don't spend. nzlockie: To you agree that introducing a new argument in your final round when I have no chance to rebut it is bad form? nzlockie: Aside from that - which is basically a rhetorical question anyway; Why is forcing prisoners to pay for education more of a punishment than taking it away from them? 9spaceking: No no no, although taking their rights away is the bigger punishment, they may never be reformed. 9spaceking: Either way your case is doomed with the prisoner's rights arguments. 9spaceking: If prisoners, needing to spend infinity dollars, to be educated, with their rights taken away, then their education cannot be free. 9spaceking: If prisoners, need not their right taken away, then we still need to punish them by forcing them to spend money. 9spaceking: Both ways, your case falls and loses. nzlockie: Sorry mate, your logic is non-existent. In your round you supported the idea that prisoners need to be punished. Free education is not enough punishment you said. So I pointed out that if punishment was your goal, why not just remove education totally. Are you now saying that that is TOO much punishment? nzlockie: If you agree that education reduces reoffending, then why give them a purchase option? Just force them to have education! If you want to punish them financially, why not just fine them? Seems a lot cleaner to me. 9spaceking: Of course forcing people to buy stuff is an effective punishment. It balances out as well. 9spaceking: Removing their rights would hurt your case anyways. 9spaceking: We must at the very least still limit their rights tho. nzlockie: wow your train of thought is hard to follow. I was expecting the rights argument so I'll try to answer that. nzlockie: Removing their right to education would not be MY preference, but it is no worse than you making education less attainable by attaching a cost to it. For that matter, their breech of other people's rights has already cost them some of their rights... their right to freedom for example. nzlockie: My question still stands - why the run around. If you want to punish them financially, a more effective way is simply to fine them. Why not do that? nzlockie: Are you saying you disagree that education lessens the chance of the average prisoner reoffending? Because you'd be against all evidence in that. nzlockie: If we agree that education lessens reoffending, then it is in society's interest to make education to prisoners MORE accessible by making it free. 9spaceking: The fines go to the company they offended, which is very likely not a educational company. Either part of the money goes to education, or they pay extra fines for the education. nzlockie: Yep either of those systems would work, if that's what you wanted to do. There would be other options as well that would work. nzlockie: Assuming me now have agreement that prisoner education COULD be free - I'd like to just question you on your "new argument" in your last round? nzlockie: At first I was a little annoyed you'd introduced a new argument when I was going to get no chance to address it. But then on reading it - am I correct in saying that your argument actually suggests a system that would HELP free education? Ie that funds from charity could go towards funding education? 9spaceking: The system that will help free education nevertheless ultimately, technically, makes it "cost" some of the rich people's money. 9spaceking: There is no point giving those prisoners free education. Why, you even go so far as to take away their rights! 9spaceking: There is no justice served in giving prisoners free education. Prisoners will not be able to change without education, at least, not as well as they would WITH educaiton. 9spaceking: Therefore we must give them education, that is the most moral choice based on ultitarianism, since it helps the prisoners AND helps us balance out the fees we spend on education. nzlockie: ... latest question. you're simply restating old arguments without posing questions of your own. is this a deliberate ploy? Are you avoiding the question for some reason? I do no do deliberate ploys. Now, for prisoner education. My opponent has failed time after time to address this rightfully. Free education is obviously available to everyone. This means that at the very least, education should be available in all of its forms, otherwise it's not free. Therefore, if I concede that prisoners don't deserve educational rights at all, then their education is unavailable, and I have won this debate because their education isn't free--their education isn't available at all. My opponent contends a free education for these prisoners, but why allow these crime-doers to have the same availability to education as free innocent men? We must punish them further. Have part of their fine go to education. Anything but allow these malicious villains to get free education. Let's see what you say, Nzlockie. I'd like to thank my opponent for the spirited, if sometimes confusing, debate. I'll now submit my final round. BOP: In my opening round, I gave two reasons to support the idea of a free education being something to strive for. Education itself is a human right. And should not be limited by wealth. An educated society prospers, meaning that it is in ALL of our interests to make education as accessible as possible. Neither of these points was effectively contested. Rebuttal of my opponent's arguments: My opponent made a few different attacks on my case. His first attack centred around the practical feasibility of a free education. The main problem with this is that I made it quite clear in the first round that this was going to be a largely philosophical question. Is a free education something to strive for? At times he did attack the notion that ALL forms of education should be free. He especially attacked the Prisoner's right to education. I rebutted this by pointing out that education reduces reoffending and is therefore in our best interests to provide access to this. He never contested this assertion. I also claimed that, although it wouldn't be MY preference, education could be removed completely if sheer punishment was all we were after. He didn't make effective arguments: There were several effective arguments he could have made for attaching a dollar value to an education. He failed to make any of them. This resolution should have been a slam dunk for CON. The fact it wasn't is only partially due to my two previous points. Unfortunately for CON, it's mostly it's down to this one. No more space. Vote PRO! I was able to enter your cross examination while logged off. Weird. I was actually going to take this if he raised the characters. You need to be really tight with your arguments. OK, what can I say? I like a challenge! Let's do this! Agreed, 4000 characters DOES seem light. I've been thinking about this all day with my, "what-would-admin-say" hat on, and I believe I have an angle, but it's a tough win for PRO! All forms, the resolutions says. ALL FORMS. College is definitely included, along with prisoner-reformation, Phd-education, doctor-education....I mean, think about it. All forms definitely refers to ALL FORMS unless it's defined differently somehow. I'm a little cautious after shooting my mouth off about the Circumcision resolution, but I honestly don't see how this could be argued from the PRO side. Surely they're only referring to basic primary, secondary and tertiary education here? nz very entertaining and visually appealing. However, I think you try to be a little too stingy and funny with your punchlines... Tone it down a bit and you will seem as intelligent as I already know that you are. 9spaceking work on extending your offense. Your current debating strategy is far too defensive. You begin strong but slowly you just take hit after hit until he totally demolished you. You can't just attack by asking questions, your objective should be to destroy the opponent. Overall, I think that this was simply a misbalance of experience in debater. 9space is better at less serious topics of a lighter tone whilst nzlockie is good with far more serious topics than this. This simply wasn't the best of either debater and I think that the Cx was simply murked by nz. Con's failure to contest Pro's R1 arguments is probably the biggest reason this debate goes to Pro. I thought there were numerous points of attack that simply weren't used by Con. That left me with two arguments. The first of these was the money analysis, which pervaded much of Con's argumentation. However, Pro made it clear that, as the resolution says "should," this discussion was based on principle and not the logistics of implementation. That left Con with the prisoner argument, which I thought was doomed from the start. It was never Pro's burden to say that all forms of education should be free to everyone, and if he had simply argued that any right to free education was at least partially lost on those who had given up their freedoms for crimes committed, I would have bought that. His argument, however, is sufficient, as Pro shows that there's good reason to give them access. Con's response that they need to be punished just isn't sufficient, and he fails to prove that this form of punishment is beneficial on any level. 9spaceking - First and foremost, you have to attack your opponent's case, especially when it has such broad applicability. Even if I bought most of your arguments, I'd still have to say that nzlockie's analysis on human rights is sufficient by itself to defeat your argument. Those rights are also more important than any desire to see justice done. Second, if you're going to argue about costs. start by challenging nzlockie's framing of the debate. He made it clear how he was framing it. Challenge it, hard and fast. Tell me why my chief concern should be implementation, why Pro's attempts to remove that ground are harmful to the debate and to you, and convince me. It's not enough to just say he's wrong. Third, you've got to sell me on why the prisoner issue is something I should really be concerned with. Link it to the resolution, make it clear why every subset of the population needs to have access to free education, or else nzlockie has not met his burden. nzlockie - Mostly a solid debate. You took a good deal of 9spaceking arguments and turned them against him quite nicely. However, be careful that, when you hold the viewpoint of this debate functioning on principle, your contentions also explain that principle. Your second contention does that nicely, but your first is problematic. If 9spaceking had made the argument that your first contention was entirely based in establishing what exists and not why it should exist, I would have bought that pretty solidly. The existence of Universal Declaration of Human Rights would matter a lot more if you were talking about what would or what could be, but you're talking about what should. It's not too difficult to explain why the UN came to that conclusion, but you should make that clear from the outset. Pro provided a well-rehearsed and cohesive argument, tackling education as a fundamental *right* from a *global* perspective. While I personally disagree that the economics were irrelevant, there was little refutation of this aspect from Con's perspective. Con seemed to concede much of Pro's argument, essentially painting himself into a corner. Con presented the economics of a single country which Pro noted was irrelevant toward education being a universal right, specifically given the identification of the US as a failure. Con: It seems like your argument was too prepared. While it is good to research your argument ahead of time, I don't see that you adequately adapted it to Pro's arguments that were actually presented.